We’re always looking for the best price we can find on a new T-Mobile handset and Costco has certainly gotten our attention with a $69.99 price point on the Galaxy S Blaze 4G. Good for new customers, upgrade eligible customers and add-a-lines with a two-year contract extension, the Costco price is the best offer we’ve seen thus far from a brick and mortar place. Given that T-Mobile’s $149.99 price comes after a $50 mail-in rebate, Costco is looking better and better. 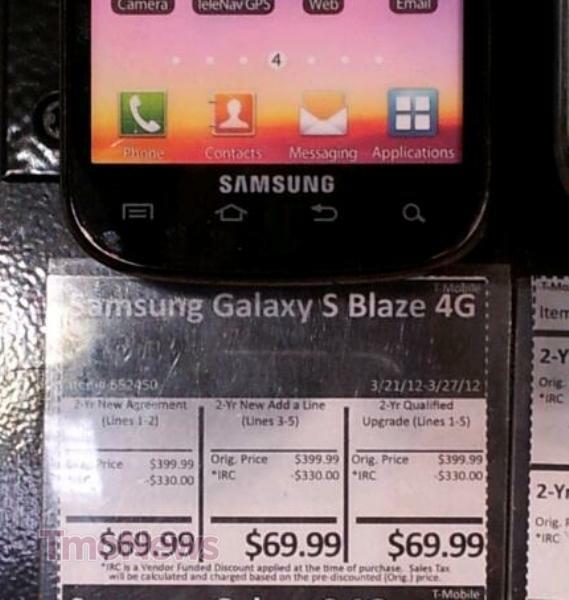 If you’re looking to pick up the Blaze 4G in the coming days, it looks like a trip to Costco is the right move. Also, mark your calendar, the Tizen Event on May 7-9th I dubbed it “Tizen Tour 2012”. I’ll be watching the event if they stream it live or keeping an eye on the blogs. is this offer for value our classic??? even their retail prices is cheaper. What gives T-Mobile????? Man, this should come out in white too. Everyone is gonna buy this and then 2 months later a white one is gonna come out. Why not just make both colors right off the back. Thas funny cuz its been 7 monthes. I checked this out yesterday. Good price but until I talked to them I didn’t realize that cell phone sales may be the only situation that Costco is very deceptive about its return policy. All electronics have a 90 day return policy but if you have buyer’s remorse on a cell phone and return it after the 14-day T-Mobile trial period you will lose your 2-year upgrade opportunity. What a joke. Who would ever bring back a phone on days 15 to 90 — unless of course it stops working — if they lose their upgrade opportunity? You should have heard the Cotsco manager dance around this policy when I had him come over to the cell phone subcontractor’s kiosk to discuss this it. He was as confused as I was. Costco should clearly state on their website’s stated return policy that unlike other electronics that truly have a 90 day, “no questions asked” return policy, the cell phone unlimited 90-day return policy is limited by the provider’s conflicting policy. Good luck doing that somewhere else without being charged a restocking fee or just plain laughed at. Again, T-Mobile is blocking your upgrades after the 14 days. Not Costco. Let me also state that the wireless kiosk is not operated by Costco. I would have 90 days to swap to a different phone no questions asked if I am willing to forfeit my two-year upgrade and pay full price. What a joke. Costco should explain it so consumers don’t think the same 90 days, no questions asked and no strings attached policy applies as it it does to other electronics. I can assure you the store manager that I had go over to the kiosk with me was as confused as I was, which proves my point that the policy is confusing, at best. You loose your upgrade because thats T-mo’s policy. Costco can’t change that. I can’t blame anybody for taking advantage of that price, BUT if you do buy your phone outside of a T-Mobile Corporate store, make sure to stop into a corporate store and have them double check your plan. I work in a store and I can’t tell you how many customers come in a month or even days later and have issues because the places they buy their phones don’t have great systems or sometimes great employees. Just today I had someone who bought their phones at Best Buy come in to swap their SIM card because BB wouldn’t and when I went into the account they had overage charges for all of their data usage because BB didn’t add it or there system didn’t save it. Things like this happen all the time. I was also able to move her to a better plan for the same price, another thing other retailers won’t do. Take advantage of the prices when you can, but just be sure to avoid any future issues by stopping into a T-Mobile store or calling customer care afterwords. $69.99 seems like a fitting price for this device. Enough said.